Next to your toothbrush, the toothpaste you choose is the most important product that you have at home to protect the health of your teeth and gums. While you may think that they are all treated equally, there are several different types, each of which offer their own benefits. As a result, it can be difficult to determine the best one for your smile. To help you make the right choice, it is important to consider your own personal oral health needs and follow the advice of your dentist in Midlothian. There are many different toothpastes on the market. When choosing one, the first thing to look for is if it is supported by the American Dental Association (ADA). This means that is has voluntarily been tested for safety and effectiveness when used correctly. If it has been approved by the ADA, it will have earned its Seal of Acceptance, which will be featured on the product. Fluoride: Fluoride is known as “Nature’s Cavity Fighter.” It helps to keep the enamel strong to prevent the development of tooth decay. It is best to always choose one that contains fluoride, especially if you are prone to cavities. Tartar Control: Tartar develops when plaque is not removed from the teeth. It harbors bacteria that can lead to gum disease. For most, plaque is easy to remove with brushing and flossing. For others, it can be a difficult problem. Tartar control toothpaste contains sodium pyrophosphate, which helps to keep it from forming on the teeth. Whitening: Whitening toothpaste can help to improve the appearance of surface stains. Over time, it can make your teeth appear whiter if used regularly. 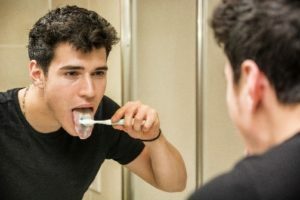 Tooth Sensitivity: If you suffer from tooth sensitivity, a toothpaste that caters to the issue can help to reduce the pain signals to the inner layer of the tooth, known as the pulp. Most people see an improvement in about two weeks. Although toothpastes are designed to promote the health of your smile, some can do more harm than good. Some are abrasive, which can cause damage to your enamel. Others can contain added sugars to promote their flavor, which can also hurt your teeth. It is best to look at the toothpaste’s ingredients to ensure that they will help you invest in your smile when used correctly. In addition to your home oral hygiene routine, do not forget to visit your dentist twice a year for a cleaning and checkup. Long Family Dental is committed to creating a legacy of healthy, beautiful smiles. With a focus on prevention, we help you protect your teeth and gums from damage to reach your oral health goals. If you have any questions about the dental products that you are using, contact our office today to speak with a member of our team.